ESTANCIA, the Philippines - Touring the coastal city of Estancia today was heartbreaking and overwhelming at times. The reality and the gravity of the situation hit each of us at different points and it was a very emotional day. The damage seemed to be even more severe than what we saw in Concepcion yesterday. Houses have been reduced to rubble. Uprooted trees are everywhere you turn, some completely stripped of their bark, showing the powerful force of the winds and the water. Power lines are down on many streets and some homes have turned them into makeshift chords to hold their laundry. Not only are many of the houses and buildings greatly damaged, but they also suffered an oil spill in Estancia from a barge that was moved during the storm leaking many gallons of oil into the ocean and forcing a mandatory evacuation on one side of the city. What has resulted is a tent city where more than 2,000 residents are living for the time being. But in the midst of all of that, we saw two great things today - the resiliency of the Filipino people and the faithfulness of our great God. 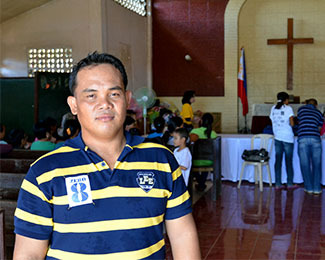 During the storm, Pastor Michael Rama, his wife and their 11-month-old son were taking refuge in the church parsonage. When the winds took off the roof of their home, they rushed into the Estancia Evangelical Church sanctuary, where 100 others were taking cover. As I heard their story, I was reminded of the passage in Psalm 46:1 that says, "God is our refuge and strength. A very present help in trouble." I think it is such a beautiful picture of God's protection to see His children gathering in the sanctuary for safety from the storm. God protected each of them that day and while many lost their homes, they have not lost their faith in the Lord. In fact, their faith has been strengthened and their hope is growing each day. Pastor Michael shared how thankful he is for God's provision. The Ramas are now living in the children's Sunday School room attached to the church while they work to rebuild. After learning of their needs today, our TBM partners made plans to buy roofing materials for the Rama family so they will be able to move back home very soon. While in Estancia, we also took a pump boat to Bayas, a neighboring island, to see the destruction. 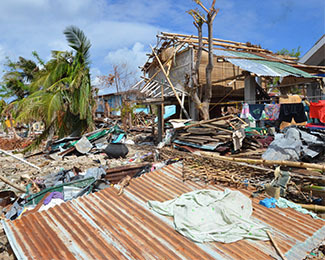 Rubble and debris line the coast and homes are barely livable for the 5,000 residents. Many of the island residents are now living in the tent city in Estancia. 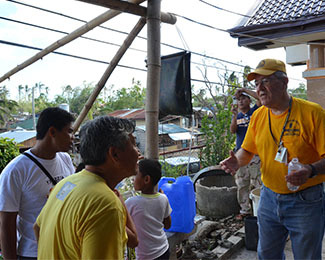 We stopped and prayed with those who are braving the dire circumstances and staying in their homes. We heard astonishing stories of how they survived the storm and amazingly, the island had no casualties from the typhoon. Water is a basic need for survival and a great concern in any disaster situation, especially in situations like these. Our TBM members, Jack and Duane, were able to set up a water filter at Estancia Evangelical Church that will provide up to 50 gallons of clean water for church members each day for the next six months. The church has a deep-water well on site that can now be used to provide purified water, which will save them the money they have been spending to bring in water regularly. It is such a blessing to watch needs being met and the joy that fills the faces of those we have been able to help each day. We have also been greatly encouraged by the hope that we have found in the people we encountered. God is sustaining and moving in the midst of such horrible devastation. Please continue to pray for provision. Many of the people that we have met are living in very difficult situations and do not have much money for reconstruction of their homes and livelihoods. One children's minister we visited with today makes $75 a month to support her family of five. She needed a new roof for her home, which also serves as a house-church and is where she holds a weekly children's ministry for more than 40 kids each week. Through gifts from the First Philippine Baptist Church in Houston, she will soon be receiving the necessary roofing materials to cover her house once again. There are so many stories just like this one. We are so thankful for the gifts that have been given that are now being used to meet immediate needs, but we know there are so many more needs yet to be met. 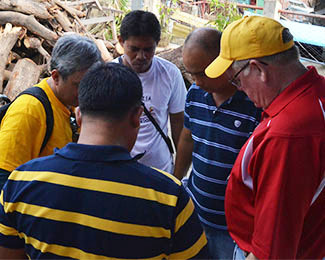 Please pray about how you and your church might be able to partner with Texas Baptists and TBM to help rebuild in the Philippines. To donate to Texas Baptist Disaster Recovery, click here. To donate to TBM disaster efforts, click here. To read daily updates from the field be sure to check out our blog by clicking here.